Associated PressA tarp protecting the damaged roof of St. John’s Lutheran Church near Goshen has torn away, exposing the inside of the historic building to rain. GOSHEN – When a dozen community members arrived at a meeting Thursday, all urging the Harrison Township board to save St. John’s Lutheran Church, the decision became not whether to save the church. Instead, it was how to find a way to pay for the thousands of dollars in repairs needed to get the roof back in place, now that the township owns the building. St. John’s Lutheran Church has stood for more than 160 years. Within its walls are decades of history, and it’s listed on the National Register of Historic Places, local residents told the Harrison Township board Thursday night. The church, west of Goshen, was badly damaged when straight-line winds ripped through the area during a storm July 1, the Goshen News reported. 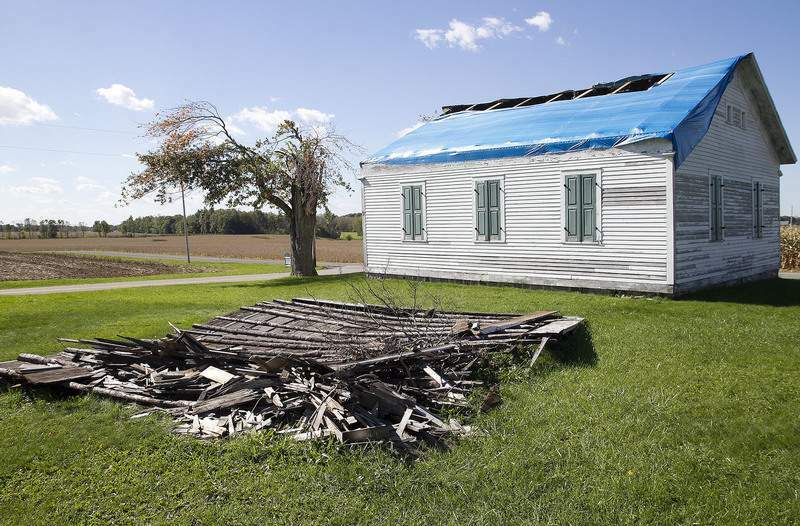 The east side of the church’s roof was blown off and broken into several pieces that were tossed like sticks onto the lawn and into a nearby cornfield. Several of the tombstones in the cemetery adjacent to the church were toppled, and others snapped in half. After the storm, volunteers installed a tarp as a temporary cover for the structure until they could have the roof repaired or replaced. But more than three months later, the roof remains untouched and the bright blue tarp has come loose, letting rain soak the walls, floors and pews inside. "When I think of all the heritage within that church, I am just quite concerned that nothing has been done to repair it," Goshen resident Lynn Miller said at Thursday’s meeting. "The roof has been open to rain and nothing is being done. … I don’t know what’s going to happen to it, but it’s going to be destroyed." Township trustee Kerry Yaw said his hands were tied until Oct. 1, when the township formally obtained ownership of the church. Until that point, the church was listed under the care of St. John’s Lutheran Cemetery Association, which dissolved in 2009, Yaw said. He said he had been working with the remaining four members of the former association to obtain the church, but it took several months before they agreed to sign it over. "They said they’d turn it over to use, and so we agreed to put that tarp on it, but until we held the title of the property, we didn’t want to spend more of the township’s money," Yaw explained. "At first, I was afraid that it would cost more money to repair it than it was worth," he said. "I wanted to get a group together and see which way we wanted to go. Tonight is the first night we’ve discussed it." Now that the township has the title, community members said they would help come up with a plan to raise money for a new roof – and would spend today putting a temporary tarp on the building until it can be determined what type of a roof would replace the old one and how much that might cost. Because the church is listed on the U.S. Department of the Interior’s National Register of Historic Places, certain requirements must be met in order to ensure the building stays on the registry, said Patricia Johnson, an Elkhart Historical Society board member who attended the meeting. "I think we can do this and I think we need to do this, but we need to do it right," Johnson said. Matthew Schuld, Elkhart County Historical Museum manager, did not attend Thursday’s meeting, but sent a letter informing the board that he would assist with finding a way to preserve the structure. "While we are not an organization that provides grant money, we can provide support in locating funders or grant possibilities," Schuld wrote in the letter. Johnson said Schuld might also be able to help the township determine what sort of roof would need to be installed to meet the registry’s guidelines. Harrison Township resident Matt Jarvis planned to set up an account Friday at First Source Bank where the community could donate to the Friends of St. John’s Lutheran Church Association. Township board member Tim Stutsman and resident Lynn Miller will have access to the funds and can work together to determine how best to appropriate the donations, the board agreed. For now, Miller said, they’ll rely on the donations of the community and seek grant funding to make the repairs. "There were some answered prayers tonight," Miller said, referring to the decision to repair the church rather than demolish it. "I’m thankful to know it will be taken care of."